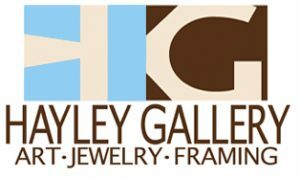 After graduating from Miami University with a Bachelor of Fine Arts, I started my art career at Gibson Greeting Cards in Cincinnati, Ohio. Since then, I have created artwork for over 30 children’s books, children’s magazines, and countless designs for giftware, giftwrap and greeting cards. I love to work in watercolor, acrylic, colored pencil and some digital, as well as paper collage. Whatever works! 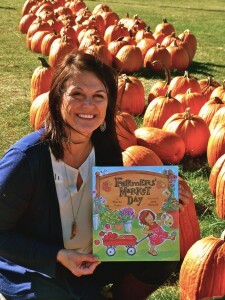 My most recent book, “Farmers’ Market Day”, written by Michigan author Shanda Trent, was selected as a Choose to Read Ohio title for 2015-2016! CLICK HERE for a classroom toolkit for Farmers’ Market Day from the State Library of Ohio. I also create hand painted paper collages of the landscape, flowers and birds found in western Ohio. In my collage work, I tear, cut and paste layers of hand painted paper, vintage poetry pages and sheet music, newsprint and other recycled papers using them to create the texture, pattern and the graphic elements of the artwork. I work from 100‘s of photographs I take on the back roads of Mercer County and also in my backyard garden where most of the summer, something is blooming! Beauty, from the simple to the spectacular, is everywhere. The weather and the skies change so quickly in Ohio that there is always something to inspire a new collage. 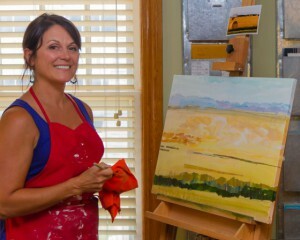 My fine art collage was featured on the blog, Studiophotos by Bill Franz, Dayton Artists at Work.